Yes, I know, I haven’t blogged in a while and I probably wouldn’t have even written this post if not for the wonderfully awesome Philippa Dowding! I have to tell you how I met Philip pa, because meeting her was just one part in the amazing Forest of Reading experience I had last spring! When I did the ‘near north’ tour, Philippa and I traveled together (through some crazy terrain and a heck of a storm, I might add) from North Bay to Parry Sound and we got to know each other and had great chats, as writers often do. I can’t tell you what we talked about (what happens on tour, stays on tour) but by the end of the trip, I was so glad to have met her! AND we exchanged books, which I love, because the one thing I cherish and collect more than anything (because it’s hard to collect cheese, though I do love it so) is signed books. Please check out Philippa’s post and her books and make sure you tell her I sent you. 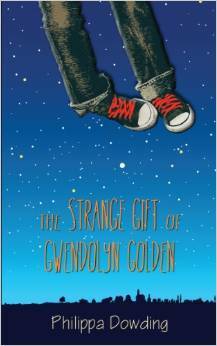 Make sure you watch the trailer for The Strange Gift of GwendolynGolden (Philippa even did the music for the video—could she be any more talented?). Oh, okay, so let’s start this with the hardest question to answer! I hate talking about projects I’m working on, because inevitably, they don’t freaking sell and then people are all like, “Remember you were working on that story about the purple alien that fell in love with a crocodile who ate beets? When is that coming out?” and I have to tell them that the book will come out on the fifteenth of never. So I think I’ll play it safe here and tell you I’m working on a wickedly funny Facebook post. 2. How does your work differ from others of its genre? Well, I wrote it, so that’s the most notable difference. Plus, my writing tends to be funny and honest. I try to mine the most embarrassing moments from my own youth (real or imagined) and project them onto my characters. Then, I manipulate those scenes to make them even funnier and work them into a plot. So yeah, there’s a good chance if you’re reading my work, you will laugh. I keep hearing there’s not enough funny books, so I’m trying to help fill the niche. I have always looked up to authors who honestly portray the lives of tweens/teens and who write the books that everyone relates to. There are so many experiences that we all go through in some way or another and sharing those experiences is one of the great parts of being human. Dogs can’t share the story of a great romp at the leash-free park or describe the taste of a really delicious steak bone found at the bottom of a garbage can. The stories we share bond us to each other with no reciprocal hind-end sniffing required. So I write to share stories like that. ALSO, and maybe more importantly, I love to make people laugh and if I can do that with strangers I’ve never met, well, that’s the most amazing feeling ever. No, the second most amazing feeling—having a kid come up to me wearing a shirt with my book on it, that’s pretty much THE most amazing feeling. This is a very wide-open question, which I’m guessing is by design… Uh, I come up with an idea, and then I have four or five plot points in my head before I start actually writing. Then I sit down (or, actually these days, I go to my treadmill desk) and start writing. I don’t normally write to outline, so I make up the story and characters as I go. This means I need to do more editing/layering of details later as I learn more about my book and what/who it’s actually about, but it’s ho w I work. I’ve tried outlining and it just doesn’t work for me. If I need an outline or synopsis for a proposal, I pretty much have to write the book (or most of it) first. 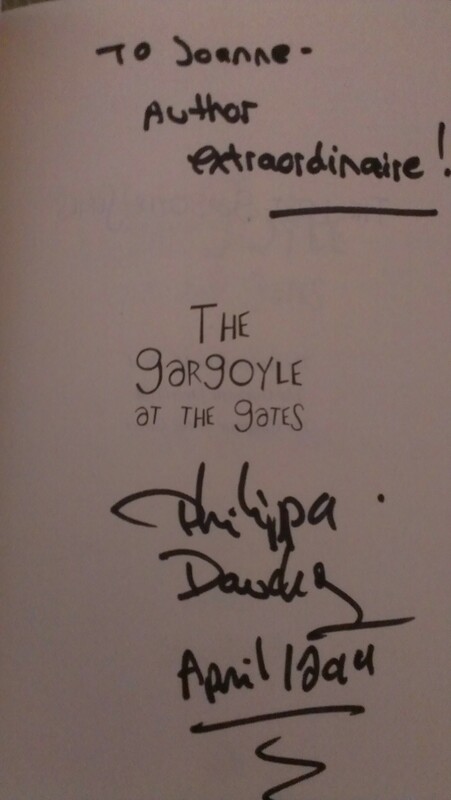 Thanks again for tagging me, Philippa! And of course, one good turn deserves another, so I tag: Jocelyn Shipley! I know Jocelyn from #TorKidLit, a social group of writers from the GTA (Greater Toronto Area) that gets together monthly. 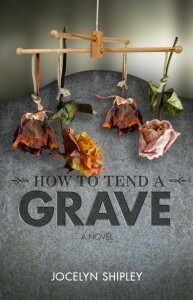 I’m a big fan of Jocelyn and her work (particularly her HOW TO TEND A GRAVE that I couldn’t stop raving about when I read it) and I’m looking forward to her post next week. Thanks so much for stopping by and feel free to leave a comment about your process.